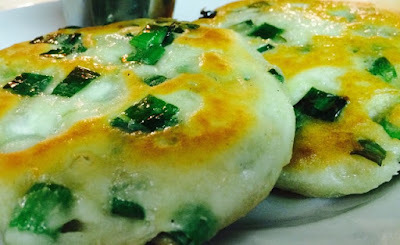 Need Gluten Free Green Onion Cakes? Two amazing options in Edmonton! Edmonton has an unhealthy obsession with green onion cakes. But can you blame Edmonton? They are yummy! There have even been petitions and websites to make Green Onion Cakes the official food of Edmonton. So I'm pretty sure when someone learns they have to eat a gluten free diet, there is instant disappointment and fear that they will never eat another Green Onion Cake again. Unless they make it themselves from scratch. Well... at least for now, that is no longer the case. The Kinnikinnick Fresh Store has started selling gluten free green onion cakes! They sell them frozen so they last and can easily keep them in stock! Not only that, after Kinnikinnick posted their gluten free green onion cake, Ted from GF Diner reminded us that they also sell green onion cakes! Two kinds! One like Kinnikinnick, frozen for quick heat, and one dough so you can make yourself. Time for a gluten free green onion tasting!